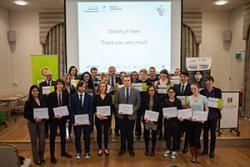 Bangor University’s annual Employability Celebration evening was recently held at Reichel Hall to congratulate and showcase students who have taken part in employability enhancing activities at the University, and demonstrated exceptional commitment to investing in their personal development. The event, which was attended by staff, students and employers, was an opportunity to award Employability Excellence Awards to students nominated by various members of staff across the University. This year saw the introduction of new award categories, including ‘Intern of the Year’ and a Students’ Union Employability Excellence Award. The evening was also an opportunity to award the Santander Universities Excellence in Enterprise Awards to students who have taken part in University enterprise events and competitions throughout the year. The final award of the evening was the Employer Engagement Excellence Award, awarded to Horizon Nuclear Power for their commitment to helping develop Bangor University students’ employability. This award follows the signing of a Memorandum of Understanding between Horizon Nuclear Power and the University in January 2015, and the recent nomination for the AGCAS Award at the Target Jobs National Graduate Recruitment Awards for employers who who provide outstanding support for careers services’ work with students and graduates. During the event, students also presented interesting and diverse reflections about their experience of developing their employability at University. Student presenters were Laura Jager (Law), Lara Pritchard (Geography), Andrew Leavers (Computer Science) and Paula Noon (Product Design). The Bangor University Enactus Team also presented their progress on their social enterprise project for Bangor, Y Bont.